We know how to make clothes smaller. But what do you do when you need to make clothes BIGGER?? 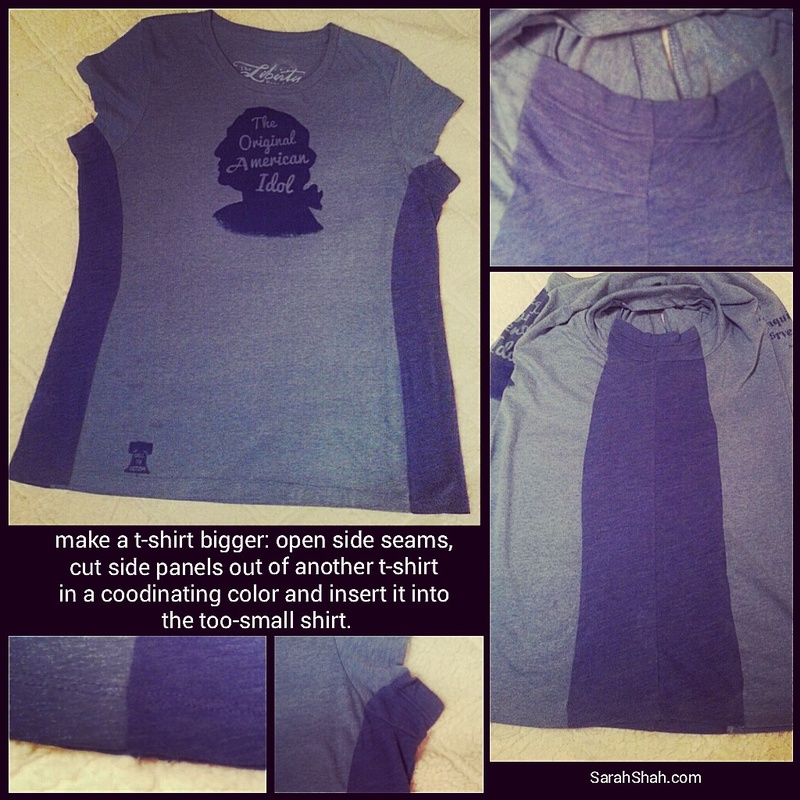 Here’s a way to make a too-small t-shirt fit. Find another knit shirt like a t-shirt or Henley shirt in a coordinating color with the same sleeve length (typically, Old Navy has inexpensive shirts in lots of sizes and colors). Cut a strip out of each side of the coordinating knit shirt. Be sure to keep the side, sleeve and bottom seams. Center the side/sleeve seams in the middle of the side strips you cut. Insert the strips of the knit shirt into the side and sleeve seams of the “too small” shirt. Match up the sleeve and bottom seams and sew the new panels in placein place. Voila! A shirt that fits with a little stretch and give so you can move and be comfortable. I loved this t-shirt from The Liberty Brand, but it was all sold out in my size. So I bought a smaller size and made it bigger. I chose a t-shirt for the side panel in a color that matched the printing on original t-shirt so the final shirt would look cohesive and the new side panels would look like they were part of the original design. I did this with the help of a tailor, but the project could be easily done as a DIY. Here’s a redo of a button down shirt. Here’s my pinterest board of LOTS of fashion re-do ideas.